A parabolic mirror focuses light. What does that mean? It means that all rays which run parallel to the parabola's axis which hit the face of the parabola will be reflected directly to the focus. But why does this happen? On this page we provide a simple proof of this fact, just by examining an infinitesimal piece of a parabola and looking at some triangles. A "parabola" is the set of all points which are equidistant from a point, called the focus, and a line, called the directrix. Later on we'll show that this leads directly to the usual formula for a garden-variety parabola, y=x2, but for now we're going to work directly with the definition. In figure 1 we've shown a portion of a parabola, with some distances marked off to illustrate this. This particular parabola has its focus located at (0,0.25), with its directrix running 1/4 unit below the X axis. 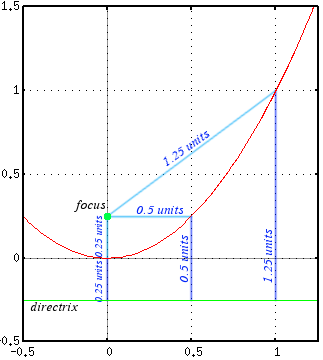 We've shown the distances from the directrix and focus to three points on the parabola: the points at 0.25, 0.5, and 1.25 units from the focus and directrix. The proof is contained entirely in the picture. We will, however, discuss it in a bit more detail, below. Lines A1 and B1 lead from point P1 to the focus and directrix, respectively. Since P1 is on the parabola, lines A1 and B1 must be the same length. Just a little farther along the parabola we have marked point P2. We've drawn line A2 from P2 to the focus, and we've drawn line B2 straight down to the directrix. As mentioned, P1 and P2 are actually so close together that A1 and A2 are (essentially) parallel. Segment b runs perpendicularly from the end of A1 to A2. A2 is longer than A1 by the piece extending past segment b, marked "a"; it is ε units long. Segment d runs perpendicularly from the end of B1 to B2, and e is the "extension" of B2 versus B1. Since P2 must also be equidistant from the directrix and the focus, segment e must also be ε units long. That is the key to the proof! Triangles abc and edc are right triangles and two of their sides (a and e, and the hypotenuse, which is c for each of them) are certainly the same length. So, the third pair of sides, b and d, must also be the same length. So, if lines A1 and A2 are δ units apart, then B2 and B2 must also be δ units apart. So, triangles abc and edc are just mirror images, so angles θ and φ must be identical. Angles φ and γ are also identical, since they're opposite angles of two intersecting lines. But then angles θ and γ must also be identical. 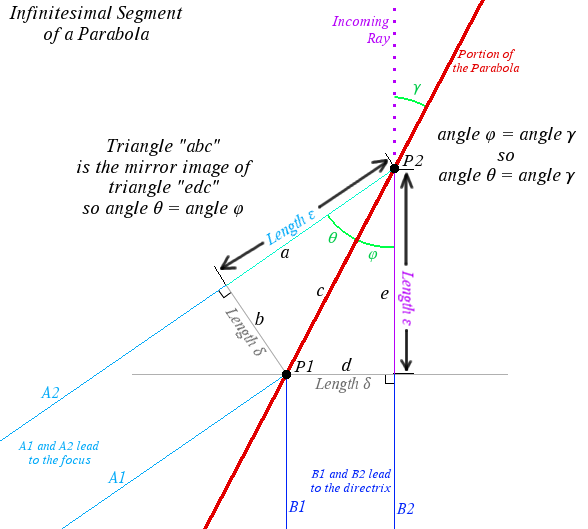 A light ray coming straight down from the top of the page (parallel to the parabola's axis), along line B2, strikes the parabola at angle γ. It's naturally reflected at the same angle -- so, since γ = θ, the ray will head down line A2, straight to the focus, as was to be shown. If it Brings Parallel Rays to a Focus, Must it Be a Parabola? Yes, absolutely ... if it's continuous. Pick a focus, and pick a point on an arbitrary curve. 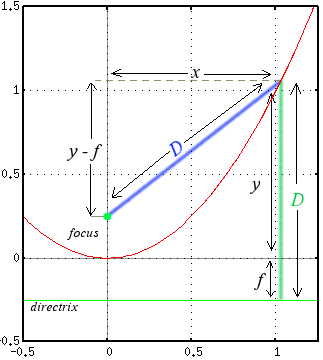 If, at that point, incoming light is reflected to the focus, then the curve must have the same slope as a parabola at that point. That is, its derivative must match that of a parabola which passes through that point. If its derivative matches that of a parabola at every point, then, since a function is the integral of its derivative, it must be a parabola. There's a caveat here, though, which is that this argument only works if the curve is continuous. A discontinuous curve could take a finite number of "jumps", and still bring incoming rays to a focus nearly everywhere. That's the principle on which Fresnel lenses and mirrors are based. On the other hand, camera lenses which do not behave as ideal parabolic lenses also don't "really" focus light to a point. That is, parallel rays are brought together into a tiny disk at the film plane (the "blur disk"), but not a single point. It's a trade-off: Parabolic mirrors (and lenses) focus on-axis rays perfectly (within the limits set by diffraction), but do a poor job of focusing items which are off-axis. Camera lenses are optimized to bring rays from many angles to a "pretty good" focus. As we can see on the ellipse focus and hyperbola focus pages, a parabola can be considered as the limit of a "stretched ellipse", or as the limit of a "stretched hyperbola". It can also be considered as the figure which stands midway between an ellipse and hyperbola. It has a single focal point and a focal line, but the directrix could also be considered to represent either an "ellipse-like" focal point at or a "hyperbola-like" focal point at , or perhaps both. Just for completeness, we'll now go ahead and derive the simplest of the parabola equations, to show that the definition we're talking about is really the usual y=x2 thing. In figure 3, we've shown the parabola again, with a number of distances marked. We'll use those to find the equation which describes the parabola. and, when f = 1/4, this is just the familiar y=x2.